Think of Campolo and you might think “passionate preacher”, “champion of the poor”, “friend of homosexuals and prostitutes”. As a story-teller he’s up there with the best. Back in the day I heard him preach on about 10 occasions and I always came away inspired to take more risks for Jesus. I bought his books and listened to his tapes. It’s now been at least 10 years since I’ve ready anything by Campolo. Frankly we’ve grown apart. He’s far more political than I and we have fundamentally different ideas about how to motivate young people. But in terms of the number of books he’s still the third most represented author on my bookshelf (after CS Lewis and Michael Eaton). 7. It’s Friday, But Sunday’s Coming (1985). This book shares a title with one of Campolo’s best sermons (which was actually a sermon about another sermon). If you ever get the chance to hear the sermon, do so – it’s an awesome proclamation of the gospel message. You will remember the sermon longer than you’ll remember the book. 6. 20 Hot Potatoes Christians Are Afraid to Touch (1988). This was Campolo at his confrontational best. 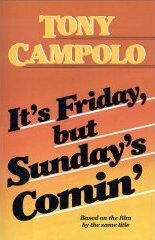 In this book Campolo challenged the idea that AIDS was God’s judgment for homosexuals. Remember, this was the mid-1980s when most self-respecting Christians weren’t even talking about AIDS. Campolo also comes down hard on the subject of money. Can rich people go to heaven? His answer is “maybe” leaning towards a flat out “no”. “It’s okay to make a million dollars but you’d better spend it like Jesus.” That makes me hope Jesus likes flat-screen TVs and Harleys because I’ve got one and one day I hope to get the other. 5. 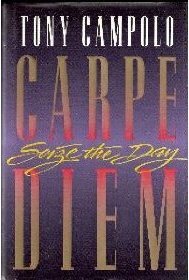 Carpe Diem (1994). This was Campolo’s contribution to the “live your life to the full” market. Dream dreams. Live simply. Make each day count. Seek first the kingdom. You have to imagine the author preaching with passion for these words to have impact, but I promise you, this book was, and probably still is, a great cure for dealing with the deadness of godless existence. 4. The Kingdom of God is a Party (1990). I was 24 and house-sitting for my pastor when I found this book on his shelf. I devoured it in one go and it left me grinning from ear to ear. This book was one of the sparks that ignited my heart for the kingdom of God. To this day whenever I think of the kingdom I envision a cosmic victory celebration that begins with God wiping away every tear and the Bridegroom rejoicing over His bride. I remember Campolo preaching on this from Revelations. “One day Babylon will fall and when that happens the angels will sing while the merchants weep. Tell me, on that day when the counterfeit kingdoms of this world pass away, will you be rejoicing with the angels or weeping with the merchants?” Man, I’ll be partying with the angels. 3. Who Switched the Price Tags (1986). The world gives us an upside-down value of things. 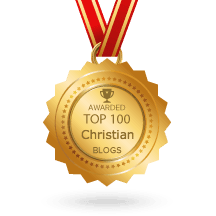 God’s good gifts, like family and friends, are valued less than cars and club memberships. You see this all the time living in a place like Hong Kong. Singles sell themselves into slavery because they think their identity is found in a qualification or a position. Young couples decide not to have kids because they would only get in the way of careers. Working parents outsource the joy of raising their own children to strangers so they can make the mortgage payments on their second home. In this book Campolo tells us that we’ve all been conned and sets us up to discover the delight and sheer fun in living the way God intended. 2. 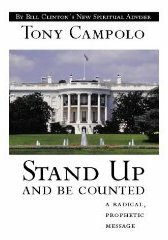 Stand Up and Be Counted (1991). Now there’s a title designed to appeal to zealous young Christians. Looking back at my copy now I am amazed at how much I highlighted in this book. Here Campolo paints a picture of the “new breed” of Christian who is part charismatic (i.e., filled with the Spirit) and part Anabaptist (i.e., involved in communities and servant ministries). The aim, says Campolo, is to match right beliefs (Pauline doctrines) with right actions (Jesus’s deeds). 1. We Have Met the Enemy and They are Partly Right (1985). This is my one and only autographed Campolo book. Back in 1996 I had a chance to ask him which of his books was his favorite and he said Things We Wish We Had Said, which was the book he co-wrote with his son. I told him that my favorite was Partly Right and when I pulled out my copy it brought back fond memories for him. It was written while Campolo was still more of a scholar than a famous speaker and it has a heavy academic tone about it. In each chapter he addresses the criticisms made against “middle class Christianity” by a different thinker (e.g., Marx, Freud, Dostoyevsky). What makes this book unique is he doesn’t set out to refute these critics, but to show that in some cases they had a point and that middle class Christianity can be improved by being honest about, and overcoming, it’s shortcomings. It was probably this book that introduced me to the writings of Søren Kirkegaard and for that alone I am very grateful.